Side A: Gaea (the Earth) hands her newborn son Erichthonius over to the foster-care of the goddess Athena. Gaea is depicted partially risen from the earth, inseperable from her native element. 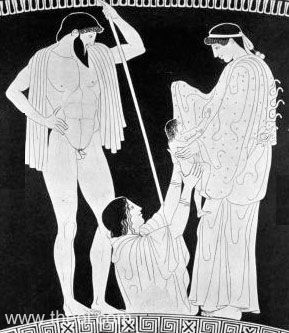 Athena, wearing the snake-trimmed aegis cloak, receives the infant. She is accompanied by Hephaestus, the father of the child. Side B: Zeus served by Iris (see other image).